The resistance units in Iran carried out protest actions in Tehran, Salmas, Uroumieh, Babolsar, Esfahan, Karaj, Chahbahar, Andimeshk, Makou, Khorramabad, Semnan, Abadan, Hendijan, Khoi, Zanjan, Amol, Golpayegan, Sabzevar, Neyshabour, Delijan, Azarshahr, Qazvin, Kazeroun, Dorood, Miyandoab, and other locations. 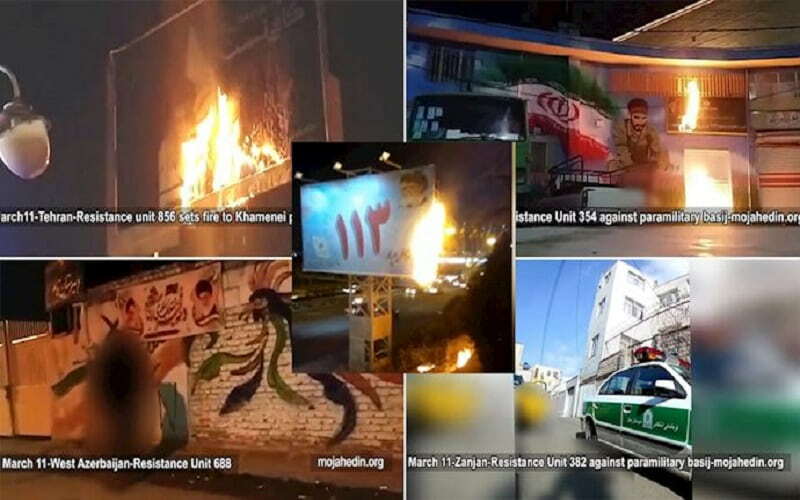 Resistance units in Iran torched or tore down regime banners depicting Khomeini and Khamenei and other regime symbols at major regime centers or public thoroughfares. The units also wrote graffiti and hung banners calling for Death to Khamenei, Rouhani, and supporting Iranian resistance leader Rajavi. They also hung banners depicting the Iranian Resistance’s president-elect for future Iran, Mrs. Maryam Rajavi, from bridges, buildings, and other locations.